Main Cottage sleeps up to 6; with two bedrooms, one with an en-suite bathroom and a second full bathroom. There is a fully equipped kitchen for self-catering purposes and a large lounge. 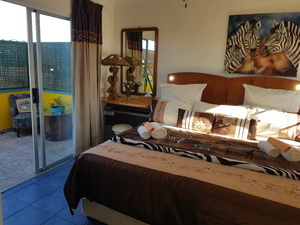 2 televisions with OpenView 21 plus channels, The cottage has a large patio and private braai facilities. We offer 3 Garden rooms. Rooms have King size beds or 2 singles, tv with openview, kitchenette with microwave, stove and small oven and all utensils, toaster, tea and coffee, ensuite bathroom, veranda. Rates per room is R690 for 2 people. self catering. Full English breakfast is R100 extra - Breakfast is served from 7.30am - 8.30am. Breakfast includes fruit, cereal, milk, yogurt, eggs, cheese, bacon, sausage, tomato, and fruit juice. Nonpork option available. Tea and coffee facilities in all units. Packed Breakfast is given for guests who would like breakfast before 7.30am. Packed lunch / Breakfast is R100 per person – includes, fruit, juice, yogurt, muffin, sandwich, chips, chocolate. Dinner available on Request: R180 per person. This must be ordered at least 1 day in advance. The outdoor entertainment area has a sundeck, braai, and an 8 seated cooled Jacuzzi to relax in.